I don’t need many excuses to eat chocolate, but I do need one to make it. And Valentine’s Day this year is that excuse, as I’m on a mission to celebrate all traditions, and create new ones with my family. For inspiration, I turned to Jacky and Michael Recchiuti of Recchiuti Confections. This San Francisco husband-and-wife team has been a part of many people's holiday traditions for nearly 20 years, as chocolate has become synonymous with love. If you haven't had their chocolate, it's truly special. I've always admired how much thought they put into making such unique confections and how connected they are to the community around them. I've also admired how they've managed to run and grow a business so successfully as a couple. (It ain't easy). To help me start my own Valentine's Day tradition, Michael showed me how to make and roll their most beloved truffles. While considered a treat, truffles are actually one of the simplest things you can make. At their most basic level, truffles have two ingredients: chocolate and cream. You chop, heat, pour and stir, and then wait for it all to set before rolling and topping. You can mix it up by infusing the cream with any flavor you'd like — think mint, lavender or ginger — or stick to the original. Here's the basic recipe. Recchiuti's basic "Force Noir" truffles have only four ingredients: chocolate, cream, butter and corn syrup. While they've tried multiple substitutes, Michael said corn syrup does produce the silkiest results. The first steps include bringing the cream and corn syrup to a boil and melting the chocolate. Michael has found that for the best results, both parts should ideally be heated to 115°F before being mixed together. This ensure that they emulsify properly. Also, heat your chocolate slowly over a double broiler so that it doesn't burn and become bitter. That's usually the most common mistake. Line a sheet pan with parchment or plastic before pouring the chocolate to set. It's best if it sits at room temperature for at least 2 hours before going into the refrigerator to prepare for rolling. This way the chocolate doesn't melt as quickly in your warm hands while rolling. 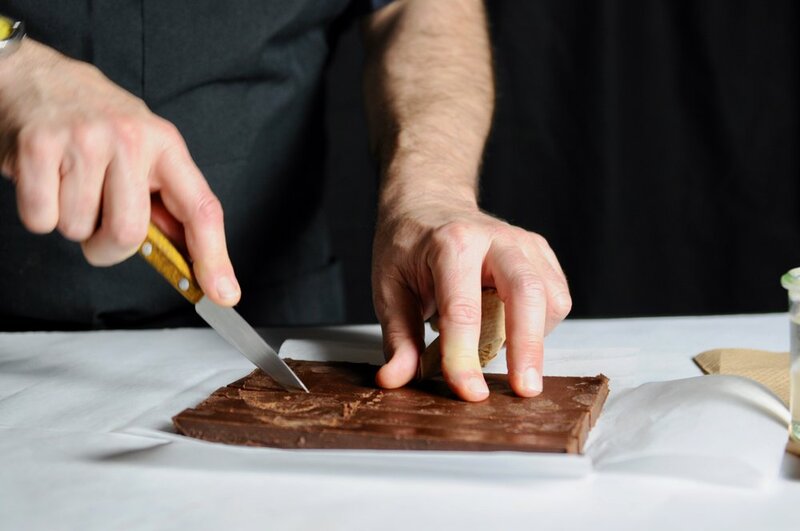 Dipping your knife in warm water before slicing the chocolate will give you a more even cut and keep the chocolate off your knife. Dusting your hands with a little coco powder before rolling will help keep the chocolate from sticking to your hands. Dipping the rolled truffles in a little extra melted chocolate before rolling will ensure everything sticks properly. It's an extra step that you can do if you want, but it's not necessary. Using a fork to roll the truffles in different toppings will help keep your hands clean to keep rolling. Here's where you can get creative and roll your truffles in a variety of toppings to make them special and delicious. Serve the truffles soon after rolling them at room temperature. If you’re not eating them immediately, you can store the truffles in the refrigerator for up to 2 weeks in a plastic bag or covered bowl. Now go forth and make some sweet memories.